I know it’s a strange passion, but in my spare time, I love counseling people on finances and creating budgets for them. I mean I really, truly love it. To take what seems like a disastrous financial situation and show people a realistic, achievable path to not only get out of any financial problems they have, but also accomplish their goals, is such a rewarding thing. It gives people hope, it calms stress, it brings peace. Over the course of time while counseling, I have seen quite a few financial plans fail and some succeed and there are common tips and traits that the successful financial journeys have in common that I would like to share. 10. Don’t deprive yourself too much – Just like a diet, if you give yourself no grace and breathing room, you will fail. Evaluate how you love to spend your time and allow yourself a reasonable budget for that. If you love to eat out and want more room in your budget for that, make cuts in other areas. Maybe cancel cable and subscribe to Netflix or Hulu instead. Or commit to only order water and no appetizers or desserts so you can still eat out but spend less each time. Or check out Living Social, Scout Mob, Groupon, Bloomspot, Travelzoo Local, etc for great deals on new restaurants to try. If you enjoy skiing or fitness classes or travel, commit to eating out less to create room in your budget to accommodate that. 9. Save for what you love – At the end of the day, money is just a tool you can use to achieve what you want your life to look like. Do you really want to travel to Europe? Buy a new car? Retire early? Buy a home? Send your kids to college? Whatever your big goals are, they are so much more achievable when you break them down to a monthly savings amount over time. If you want to go to Europe next year, you could take a hit to a credit card of several thousand dollars and pay interest on it for a year or more following the trip, or you can save $150/month until the trip comes and pay cash for everything while you are there. Big expenses are much more enjoyable when you don’t have the stress of the looming big credit card balance hanging over your head. A successful financial plan accounts for future spending and starts saving for it now. I love Capital One 360 for savings accounts. They have one of the best interest rates and you can have as many accounts as you want without any fees. I currently have an emergency fund, vacation fund, car maintenance fund, home maintenance fund, and gift fund, and I love having a separate name for the money I have saved for different things. You can open a free account and get up to a $100 bonus with them here. 8. Keep money in savings – Are you one paycheck away from a financial disaster? It is absolutely essential that you have an emergency fund. If you don’t have one, this should be your first goal. Put $1,000 in savings over the next few months and then start working on your debt balances. You can’t break the cycle of putting everything on a credit card if you never have any other source of funds to cover unexpected expenses. Your eventual goal should be to have 3-6 months worth of expenses in savings so that if something happened to your income you would have a cushion of time to continue supporting your family while you find another job without facing foreclosure, repossession, etc. When you do have money in savings, it can be tempting to drain your savings to pay off a credit card. Please don’t do this. When you eliminate your savings to pay off credit card debt, you are putting much bigger things at risk in place of that credit card, you are forfeiting your ability to make your mortgage or car payment in a financial emergency. 7. Don’t risk your house – Don’t use a home equity line of credit to pay off other debt. Yes, you could get a lower interest rate, make less payments, etc. It’s not worth it. If you ever find yourself in a situation where you can’t make that payment, you’re not looking at just late fees and collections, you’re risking your house because you put it up as collateral on the loan. Just don’t do it. 6. Plan menus – For almost all of my clients, food is the single most common budget buster. If you’ll invest the time to plan out your meals for the week, using what is on sale, and then stick to that menu, your budget will almost always be successful. This is such a common overage area because it so easy to eat out when we’re tired, had a hard day, craving something, not in the mood to cook, the list goes on and on. Plan the nights you will eat out and plan your meals for the rest of the week before going to the grocery store. 5. Cash is king – It is SO easy to spend money when you are swiping a card, even a debit card. It’s so easy to go over budget when you just get a bill at the end of the month for your credit card. To really stick to your plans, use cash for the first few months. When you go to the grocery store, just take the cash you budgeted for it. 4. Track your progress often – There is a saying we use at work very frequently: you manage what you measure. This is one of the most essential tips I can give you, keep track of your spending and know where you are. Mint.com is one of my favorite tools for this and it is free. It will pull your spending in from all of your accounts every day and make it easy to classify into the budgets you set. 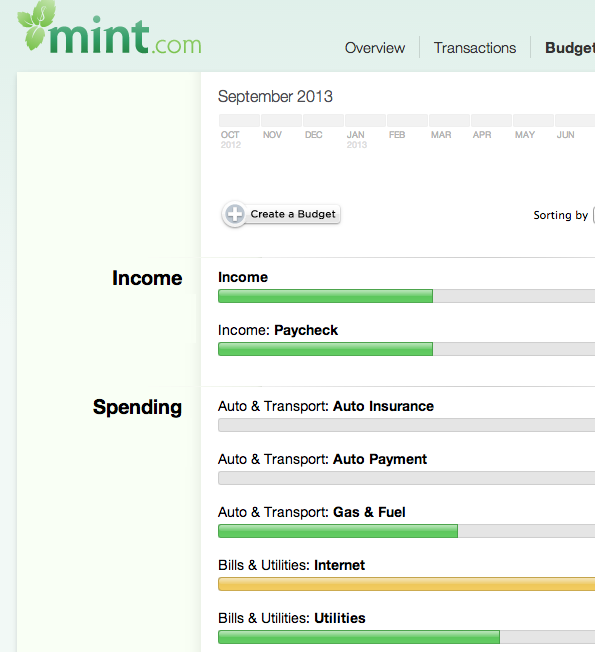 It gives you a visual chart of where you are in each of your budgets and the app is easy to use for tracking on the go. You will be most successful the more frequently you classify your transactions and check in on your progress. If you can commit to spending just 3 minutes each day classifying the previous day’s transactions and checking how much money you have left, you are very likely to succeed. Even once a week is a great start. The more you let it pile up, the more daunting of a task it becomes, and you are more likely to just give up. 3. Set many achievable milestones – Let’s face it, sticking to a tight budget just isn’t very fun. However, once you start to see progress and get a taste of financial freedom, achieving your goals gives you such a sense of accomplishment and the motivation to keep going. So set many goals, set goals that you can achieve fairly frequently to keep yourself motivated. Set a goal to build up at least $1,000 in savings, then once you have met that, use the extra money you were putting towards that towards a credit card you can pay off soon. Once you accomplish that, put all of the money towards the next goal. Keep yourself motivated by setting frequent, clear, achievable goals. 2. Have an accountability buddy – Talking about money seems to be so taboo in our culture but an accountability partner is KEY to success. Just like you will work out more frequently if you have a running partner, a friend who is also sticking to a budget will make it so much more enjoyable and help you succeed. Being able to have someone to celebrate with when you overcome a spending temptation, or achieve a milestone, or talk about what areas you are struggling with will be so encouraging. Celebrate even the little successes with each other (“I brought coffee from home and drove right past Starbucks!”) that only people in the same boat as you can really appreciate and help each other achieve your goals. 1. Discipline – At the end of the day this is what it all boils down to. Just like you won’t lose 30 pounds instantly or without sacrificing some things and putting the work in, you won’t shape up your finances overnight. You are really going on a financial “diet” or “health kick” and it takes the discipline of more days making good choices than slipping up. I like all your tips except # 7, paying 20% interest on credit card debt or 6% on a student loan doesn’t make sense if you can borrow at 3.5% on a secured line of credit on your home. The interest saving will allow to pay off your debt sooner as long as you have # 1 discipline! I agree with you if a person is disciplined. The reason I recommend not doing it at first is that I have seen too many people pay off their credit cards with an equity line of credit then charge more on their cards when they aren’t as careful and now they have both payments. Once someone is used to living within their means though, yes, the lower interest rate can be a benefit. Yes, I had a client that got deeper into debt using his line of credit. Its hard to judge if the person is discipline or not.